A good private instructor is able to prescribe a practical progression of drum techniques and provide a context into which the techniques fit. This is essential because the subject of drumming is vast and it is difficult to know where to begin. In other words, you don’t know what you don’t know. A private instructor provides a frame of reference to begin learning drums. Your best option is to find a competent private instructor. You can inquire at local colleges that have music programs, or local music stores. If it offers lessons, the music store will suggest their drum teacher, which may not be the best teacher for you. So, seek a teacher with whom you like learning and whom is interested in teaching the things you want to learn. Private drum lessons will normally cost $15 to $30 per a half-hour lesson, and are normally a weekly lesson. I understand that taking regular drum lessons is expensive. I took weekly lessons for 13 years. While you can always benefit from taking lessons from great drummers, after 2 -3 years, you may be able to learn things on your own. College Student majoring in music may be happy to give you lessons to get you started. College Professor. You may be able to find an instructor from whom you can take lessons as needed. Professional Drummer. I will sometimes contact a professional drummer (from the Milwaukee Symphony Orchestra or a university) when I need to learn a specific skill. I’ll take a lesson or two in preparation for a performance of unfamiliar or stylistic techniques. Drummers You Know. A friend or relative who has been seriously playing drums for more than a year can provide introductory instruction. Choose carefully since bad techniques are challenging to unlearn. It’s good to watch good drummers play. There are many great drummers who have made instruction-oriented DVDs. A lot of these have found their way onto youTube. Even if it’s not an instructional video, watching great drummers play opens your eyes to the drumming universe. I learned how to read music, and used (and still use) books extensively to learn drums. To some drum students, this seems like a slow start, but in the long-run, you can go further faster if you read drum music. However, it’s not mandatory. There are great modern musicians who do not read music. There are also drum instructors who do not teach reading music. You can decide which method you prefer. I teach drums using a combination of both approaches. You can find used drums for cheap. There are a couple issues here. It’s possible that how much you like your drum set will affect how much you play your drums. As a young drummer, I was more eager to practice because I liked my drums. Would I have practiced less with junkie drums? Maybe not – I may not have known the difference, but my drum set did inspire me to practice. I’ve had students with old, banged-up, or poor quality drum sets, but who’ve practiced intensely and excelled because they were so interested in playing drums. If the banged up old set discourages you from practicing, spend a few hundred dollars more to get a drum set you like. The thing that really matters about the drum set is that you have a space in which to set the drums up so they are comfortable to play, and that you have drums and cymbals to hit. Quality and other details are not nearly as important. I prefer the smaller-sized drums (listed in parentheses) because they are easier to position and can be tuned more to my liking. The only exception is the snare drum; 14″ snare is preferred, and is vastly more common. When shopping for a drum set, be sure to read details of what’s included. Often, cymbals are not included. Cymbal stands, stool, and pedal may not be included. As a new drummer, there are some basic elements of drumming you need to learn which don’t require a complete drum set. Instead, you’ll only need drum sticks and a practice pad (or snare drum). How to hold drum sticks. How to make a stroke. Ask your drum teacher to help you select a drum set. Your drum teacher will know what the local scene is like and where you can get the best drum set for your interests. Your drum teacher’s advice will be very helpful. Again, hopefully he’s not just trying to promote what the music store sells to get a commission. Don’t be afraid to ask questions and don’t buy until you are comfortable with what you’re buying. Start with size 5A or 5B. I use 5B and variations thereof. 5A is too light for me. I’m 6’1” and have average-sized hands for my build. Drummers with smaller hands and arms prefer smaller sticks. For even smaller hands, 7A will be good. Smaller sticks are also useful in situations where a softer dynamics or softer timbres are required. Note: I usually begin new students with 2B drum sticks on snare drum – for exercises and muscle-building. Drumsticks bigger than 5B will be overkill in many settings. Size 2B is heavier than most drummers need for drum set. Musical style and application will also affect stick choice. As a beginner drummer, it takes some time playing with sticks to really know what you like. Don’t worry about it now. It will not affect your learning or playing for the first few years. 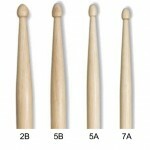 As you develop, you will come to prefer certain drumstick models (size, shape, material). I’m a professional musician and I will buy factory seconds drum sticks if they are good quality. Nova drumsticks are one good option. They are the factory seconds brand of Vic Firth, one of the most famous and best quality drumstick makers in the world. If factory seconds are not available, get Zildjian, Pro-Mark, or Vic Firth hickory drum sticks. There are other good, but less common, brands of drumsticks. Ask your drum teacher to comment on other brands. I see students come into lessons with new flashy drum sticks; colors, glitter, rubber grips. Usually I find they should have spent more time practicing and less time shopping for cool drum sticks.